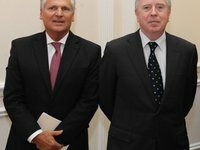 A European Parliament monitoring mission lead by ex-president of Poland Aleksander Kwasniewski and ex-president of the parliament Pat Cox will arrive in Ukraine on March 28, Kwasniewski has said. "For two or three days [we'll stay in Ukraine], we will visit Kharkiv to meet with [jailed former Ukrainian Prime Minister Yulia] Tymoshenko, and we will come here [to Kyiv]," he told journalists in Kyiv on Tuesday. According to Kwasniewski, the mission's scheduled will be intensive as usual and the observers will hold many meetings. Asked about the specific task of the mission this time, he said: "We have to solve these problems [with the imprisonment of Tymoshenko and former Interior Minister of Ukraine Yuriy Lutsenko]." Kwasniewski also said that the members of the mission would not discuss their tasks until some common solutions are found. He added that the mission is planning to submit its final report to the EU leadership in early May. "Certainly we have many problems yet to be solved. All of these problems are connected with imprisoned political figures. It is the most difficult aspect," he said, and added that Cox will provide his information "at the beginning of May." As reported, the European Parliament monitoring mission to Ukraine headed by Cox and Kwasniewski started monitoring the court proceedings involving Tymoshenko on June 11, 2012 under an agreement between Ukrainian Prime Minister Mykola Azarov and European Parliament President Martin Schulz. Their mandate was subsequently expanded to include the court proceedings involving Lutsenko and former Acting Defense Minister of Ukraine Valeriy Ivaschenko. Their work was suspended when parliamentary elections began in Ukraine and was then restarted. Their latest visit to Ukraine was on February 4-5, 2013. They visited Tymoshenko at Kharkiv-based Central Clinical Hospital No. 5, and Lutsenko at Mena penal colony in Chernihiv region.